log in, work through the rest of the installation, , do not plug in your hardware even if instructed to do so, just press OK, Next, Finish and such..
Then plug in your MBOX2 Pro, and wait 2 mins (to let the new driver install correctly). Windows 7 x64 and Mbox 2 PRO? I have recently updated my system from an old windows XP system to a Windows 7 x64 system. It is stable as hell!! 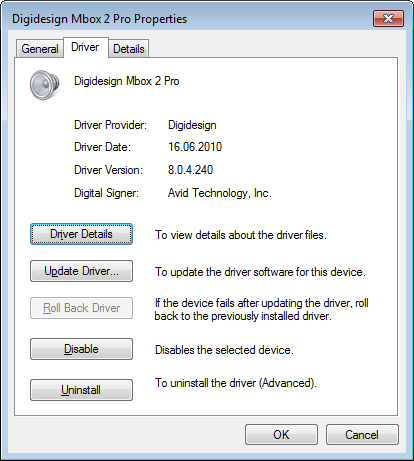 These drivers do not support the original Mbox (the original Mbox is not supported with Pro Tools 8.0.3 and higher). The 8.0.4b drivers support ONLY the following devices: 003, 003 Rack, 003 Rack+, Mbox 2, Mbox 2 Mini, Mbox 2 Micro, Digi 002, and Digi 002 Rack. Updated drivers are not required for the Mbox 2 Pro or Eleven Rack, whicj means you only need pro tools v8.0.3 without any extra drivers!